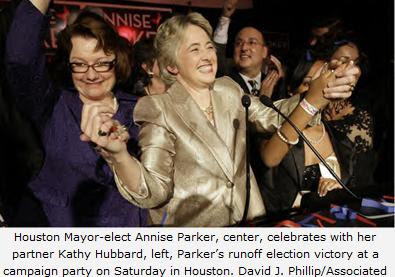 Stonewall Gazette: How did Houston's gay mayor win? How did Houston's gay mayor win? Lesbian Annise Parker persuaded conservative Texas's biggest city to elect her mayor—even as liberal states reject gay marriage. In what would seem a milestone for the "topsy-turvy" gay-rights movement, city controller Annise Parker, a lesbian, has been elected mayor of Houston — the largest U.S. city ever to elect an openly gay mayor. Parker, 56 — who has two children with her longtime partner – beat fellow Democrat Gene Locke, 61, a black lawyer, by a healthy margin (in a year when liberal Maine and New York rejected gay marriage). How did she do it and what does it really mean? (3) Parker managed to be reassuringly boring and memorable at the same time. (4) A lesbian mayor doesn't mean much in the absence of real gay rights.